Shelby is a fabulous mama to a 5 1/2 yr old singleton and 4 yr old twins! All girls. Wow, right! She reached out to Fashion Fix because she was staring at a closet full of clothes, but felt like she had nothing to wear! I’ve heard that before, and knew exactly how to help. 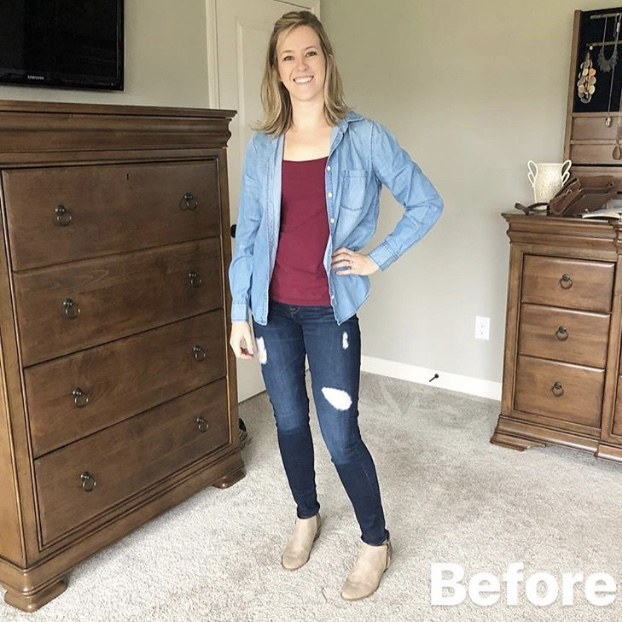 She scheduled an In-Home Wardrobe Consultation and we got to work! I showed her what she could get rid of, what to keep, and what the missing pieces were that she needed to have in order to get the productive wardrobe she wants. We also played dress up! Introducing new ways to wear pieces that were already in her closet. Showing her how to wear color better, what to accessorize with, and how to implement style tricks for that Pinterest worthy look! “I had so much fun with you! I felt like you were my BFF helping me style myself! Loved every minute! Thanks for sending the photos. I will definitely be sharing the pics and spreading your name around!”. “Let me tell you what! I have been SO confident when leaving the house since our wardrobe session! I purchased a few new items you suggested and it has made a world of difference! I'm so thankful for your knowledge and guidance!”. Seriously, I could pass out from feeling all the love and excitement! This is the why I am driven to do what I do!. Shelby is not the only one who can have fun in her closet! I want to work with you and get you the tools you need to feel empowered and confident your clothes! Find out more about styling services here.